A new map, which players will see in the update 9.7, is devoted to landing of allies in Normandy in 1944. In the update 9.7 players will discover a new map, after getting on which they will find themselves in the coastal part of Normandy, near the beaches, where on June 6, 1944 Allied troops landed. The map can be interesting not only because of the historical links, but also because of its design. This is a kind of exhibition hall of German fortifications from the whole "Atlantic Wall". In the early morning of June 6, 1944 to the shores of Normandy, a landing fleet approached, unequalled in the whole history of wars. Allies opened the second front, and the troops, expelled from the continent four years ago, were back to recoup for past failures. The landing took place at five lots - beaches. They were called "Utah", "Omaha", "Gold", "Juno" and "Sword". As envisioned by the command, during the first day of the landing troops were not only to make lodgement on the shore, but also to smother the defensive lines of the German "Atlantic Wall". One of the major problems for the defending side was - the need to predict where exactly the enemy would have a bash. The Germans understood full well that the Allies would try to land but identified the direction incorrectly: they believed that the landing will take place in the Pas-de-Calais, in the narrowest part of the English Channel. And when the reports about the landing in Normandy have come, the German High Command was sure that this was just diversionary strike. The intensity of battles alongshore was different. At "Utah" by noon, it became clear that success was achieved: the US troops not only made lodgement on the shore, but also got ahead for 8 km inland. The holdout was stronger in the lots "Gold", "Juno" and "Sword", but the Allied forces were able to dislodge the Germans from the coastal strip and to make lodgement. The most sanguinary battles took place on the beach "Omaha". The landing from the very beginning was problematic: because of the heave of the sea, most of the support tanks have sunk. Neither bombing nor artillery fire from the ships could cause serious damage to the German defence, so the infantry went ashore, receiving heavy fire from small arms and artillery along the way. For a few hours it seemed that the troops would perish in the sea. Only by evening did they manage to occupy the last pass of the beach and to make a lodgement. At the first day of battles on "Omaha", about 4,000 were lost. Within several days after the landing, the Allies expanded and united the foothold. Across the Channel, there were more and more ships. Aircraft strips were being built. An artificial harbour arrived to the French side, with the help of which supplies could be picked up more effectively. The battle for Normandy impended so every soldier and officer of the allies knew how difficult it would be. The game map "Overlord" is not tied to a particular location, but is the most similar to the landscape of beaches of "Utah" and "Omaha". Beaches, coastal cliffs and a small town some distance from the sea are inspired by real places. The time the “Overlord” map was set in reflects a few days after the historical landing – it features the serious battles which took place and you can see skeletons of destroyed German and American enginery. An interesting historical fact you might like to note is that German tanks were not involved in the battles on the coastline as the personal permission of Hitler was required. By the time permission was granted, it was too late. On the left part of the map there is a beach with anti-tank and anti-landing staff. In reality, their positions were much closer, but due to the game specifics, level designers "thinned" them. However, it can be imagined what it was like for infantry and vehicles to break through steel and log barriers under the hail of bullets. Concrete gun settings and a variety of bunkers can be found on coastal rocks. These fortifications were modelled based on actual firing points of the "Atlantic Wall". Most of the objects were developed specifically for the map "Overlord" and are of interest not only as a potential shelter or hindrance for a tank, but also as historical elements. Concrete positions for heavy howitzers were left empty. Over the walls, players can hide their hulls and battle using their turrets. These structures were inspired by the angular observation bunkers from the movie “Saving Private Ryan” – a gun was fired from the observation loopholes. Artillery concrete positions were copied from the real bunkers, armed with captured French ship's cannons. 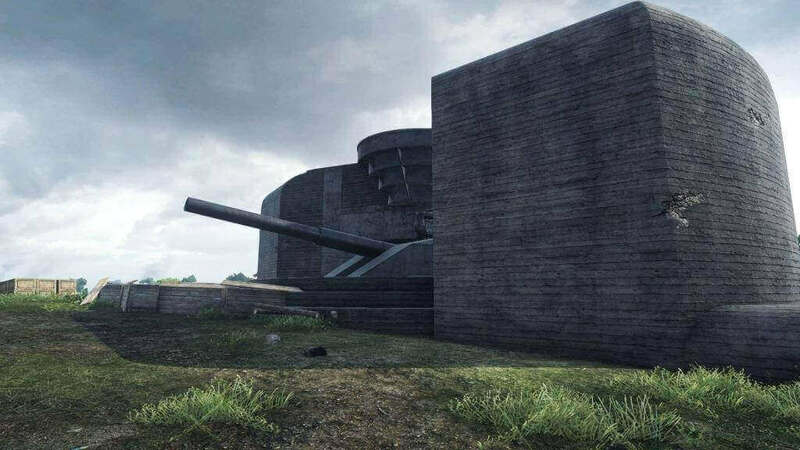 A grand bunker with a gun from battleship on the right side of the map is worthy of mentioning. This is a copy of the so-called "Battery Todt", the armed 38-cm naval gun. The battery was located near the Calais town - far from the landed coastline of the "Overlord". However, our designers decided that such a structure is worthy to be placed on the new game map. It should be noted that in the games of military-historical themes this bunker has never previously appeared. When creating such objects as bunkers and pillboxes, a method of constructing special 3D-models based on photography was widely used. It was also applied for some of the architectural objects: houses, farms and so on. 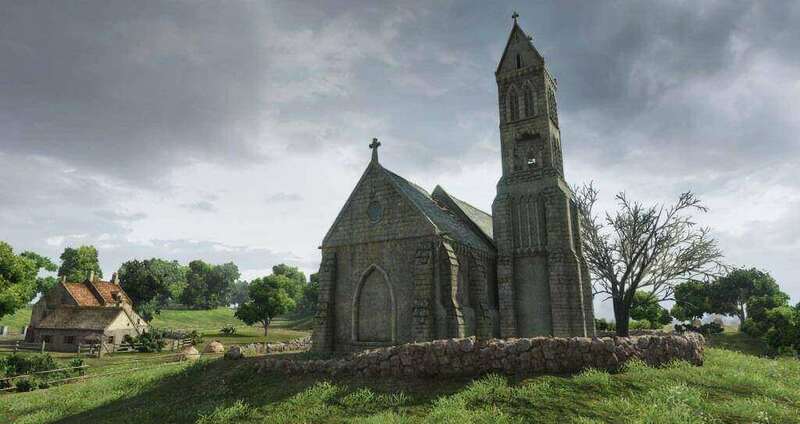 The most interesting building on the map is for sure a church, recreated in exact accordance with the real church in the French town of Bayeux. Although the map "Overlord" is not a virtual copy of the real terrain on the Normandy coast, it could be described as historic. Designers managed to capture the atmosphere of the June days of 1944 when the second front line was opened.